RBO is pleased to welcome a local hero to our practice o March 10, 2018: Oakland-based Olympian Magdalena Boulet. Magda is a champion marathoner and ultra marathoner, a mother of a 12-year-old son, and she leads the product development at GU Energy Labs in Berkeley. She earned a spot on the U.S. Olympic Team by finishing second in the 2008 U.S. Women's Olympic Marathon Trials. She also won two team Bronze medals as the captain of the US Cross Country team at the World Cross Country Championships in 2010 and 2011. Her 5K PR (personal record) is 15:14, her half marathon PR is 1:11:46, and her marathon PR is 2:26:22. After a ten-year career running marathons on the road, she transitioned to running trail and ultra-distance events in 2013. In 2015, Magda won her 100-mile debut at the prestigious Western States Endurance Run, and was named North American Ultra Runner of the Year. Magda grew up in Poland and immigrated to the United States in 1991. She was sworn in as a U.S. citizen on the morning of September 11, 2001. She earned her bachelor's degree in human biodynamics from U.C. Berkley in 1997 and a master's degree in exercise physiology from Cal State Hayward. 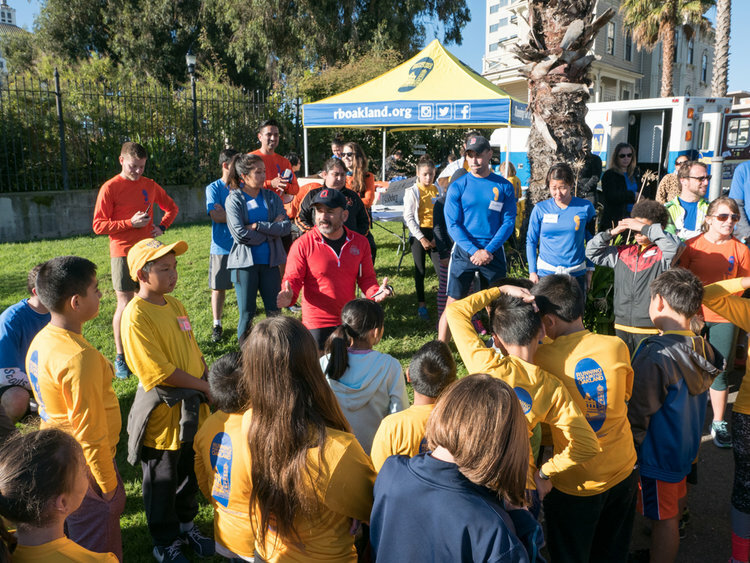 runbouletYesterday I spent the morning with the Running for a Better Oakland (RBO) kids, who were told that a special guest was coming to speak to them a couple of weeks before the Oakland Running Festival. After my talk and while on the run, one of the girls asked me what was so special about me and that she thinks everyone is special. I took the opportunity to tell her and the other kids that I am not particularly special. Instead, I told her that we all have our talents and sometimes it takes time to find out what that is. For me it wasn't until I was in my late teens when I found that I was a relatively talented runner. But the truth is that I didn’t just put on a pair of shoes and go straight to the Olympics. Everything I’ve achieved in running can be summed up by one word: Perseverance. Getting to any finish line is not just about effort. It’s not just trying your best. It’s refusing to give up, even when there are obstacles in your way. It’s staying focused on your goals and driving toward them when things don’t go as well as planned. To persevere is to continue working even when the goal is a very long way in the future. Most goals that are worth achieving take many months or many years to achieve. Thank you RBO coaches, volunteers and runners for inspiring me. I’m so proud of each and every RBO runner for taking on this challenge, and I wish them all the best of luck in their running and life. RBO thanks Sam & Caitlin for their visit on March 25, 2017 to the Half Marathon and 5K students. Thanks for sharing your passion with us and inspiring us! Caitlin Smith: age 35, engaged to Sam Robinson - Lives in Oakland - when she is not running, she is coaching running, Instructing Pilates, painting/drawing and delivering babies as a Doula. Caitlin Smith is a multi-talented runner, who won't choose trail nor road, she will race both. “They complement each other well, even though they’re slightly different sports,” she says. “I like being able to measure time improvements on the roads and just run by effort on the trails. Among other running accomplishments, Caitlin qualified for two Marathon Olympic trials, 2012 and 2016, she won the U.S. 50K trail championships in August 2015, in California. She has won many races including the prestigious North Face Endurance Challenge 50 mile in 2009.The back-and-forth nature of her training keeps her engaged. Sam Robinson has the course record for the Oakland Half and also won Berkeley Half 2015. He is an ultra runner like Caitlyn. Sam is a Grad student at UC Berkeley. RBO thanks Verity for her visit to the Half Marathon team on March 18, 2017. Thanks for sharing your amazing life story with us and inspiring us! Youngest of four adopted children. ATHLETIC OVERVIEW As a kid Verity (V) did lot's of sports, liked to try all kinds of things. The rule was (by her father) that if she did not finish a season then don't ask to do a new thing. So the lesson of finishing things began. Her parents had a lot going on so V had to get herself to the game or ballet or whatever and get herself home. During the tennis phase she would walk 3 miles either way to the lesson on the Saturday and worked out a good shortcut through the local nature reserve. The lesson of making things happen was learned. At 22 she bought a bike and a car and set off from Sydney to Queensland to a new job and a new start. It was time to leave home and grow up. The lesson of being brave began. Early on, Triathlon was the sport of choice, and V, self coached, was selected to join the Australian Triathlon Team for the World Championships in 1991. But quickly, V decided that she had in reality fallen in love with running. That running was her best bet to do well and travel the world.Running felt like home. V has raced all over the globe, India, Bangkok, USA, New Zealand, Japan, French Polynesia, Fiji etc. Running became a ticket to adventure everywhere. And it was AWESOME. Over the next three decades Verity won several State and National titles over distances ranging from Cross Country all the way through to 50km roads. With a lot of consistency, hard work and good humor V has completed over 140 marathons, 250 or more triathlons and lord only knows how many other races of various distances as well. CRIKEY. A prolific racing list and injury free since 1991. Not that there are not days when she has the odd niggle or is sore from racing but V has rules about not beating her body up. To build up and get stronger. To treat her body with respect and kindness. Trust that it is progression not perfection that counts. Once upon a time when V decided to leave the group she was running with to self coach herself in running, she was told if she was lucky she might win a race or too and do ok.
V decided that was bad advice, that it was not about luck, life is about preparation. But most of all about believing you can do stuff even if other people try to limit you or label you. 1998. Aust Marathon Rep. Athletics Aus. 2001. Australian Mountain Running Team. World Mountain Running Champs. Italy. 2004. Selected in Prime Ministers Five. 2009. Australian 50k Road Champion. Canberra Marathon. Australian 50k Championship. Verity loves ORF and makes a point of running it every year if around. “The reason we race isn't so much to beat each other, but to be with each other.” Christopher McDougall. Sally and Sarah, thanks a lot for your generosity and making such a difference in RBO gals' life! Oiselle is a for-women, by women athletic apparel company based in Seattle, Washington. 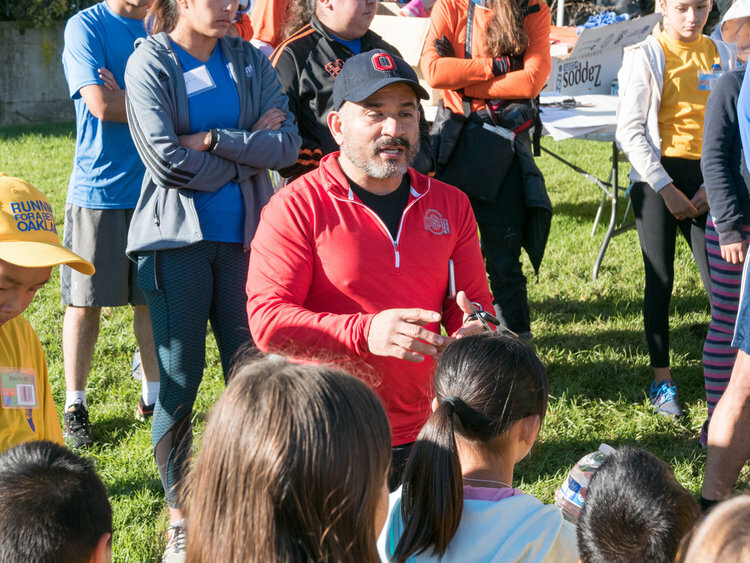 We believe in the transformative power of sport and physical movement. Sally Bergesen founded Oiselle (www.oiselle.com) in 2007 during her search for "non-poofy" running shorts, and has grown the company with a mission to make great product, improve the sport, and build the sisterhood. Sarah Lesko, a Family Physician, joined forces with Sally in 2010 as her running buddy and is now Oiselle lead on shenanigans and philanthropy. 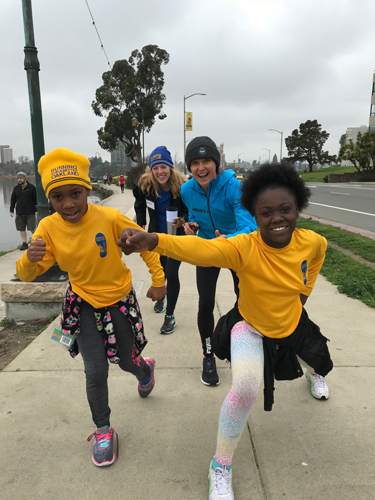 Oiselle is thrilled to kick off our "GOT Bras" program--short for "Girls On Track"--with Running for a Better Oakland. 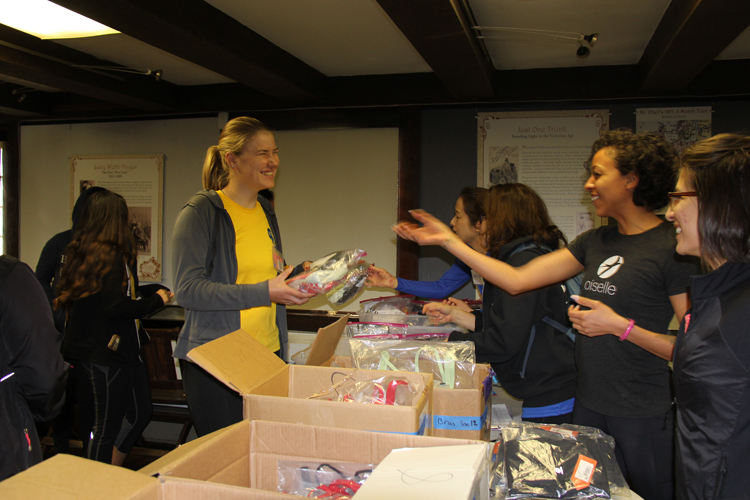 Our goal is to give away at least 2,000 sports bras this year, to support girls aged 9-17 as they stay active through the changes of adolescence. Thanks Pat for running such a great campaign for your 30th Birthday and a Super Bowl Pool for RBO! Not to forget your contribution to our first round of scholarship with "GCRC's Oakland's Youth is our Future" scholarship! Grew up in Oakland ! Live in Oakland ! Run in Oakland! Founder of the Green Cormorant Run Club ... Encouraged to run in Middle School to stay out of trouble and set goals! Now wants to share his experience and success with RBO Youth: " I love everything RBO is about. I was once a kid in Oakland who used sports as an avenue to express myself and help me stay on the right path. There are certain figures like your mentors who I looked up to and made sure I stayed on the right path. It's awesome to watch RBO grow and seeing them all participate in the ORF".